Poet Geoffrey Brock is the author of Weighing Light. His poems and translations have also appeared in The New Yorker, Southern Review, Paris Review, and elsewhere. He has received a Stegner Fellowship, an NEA Fellowship, and a Guggenheim Fellowship. 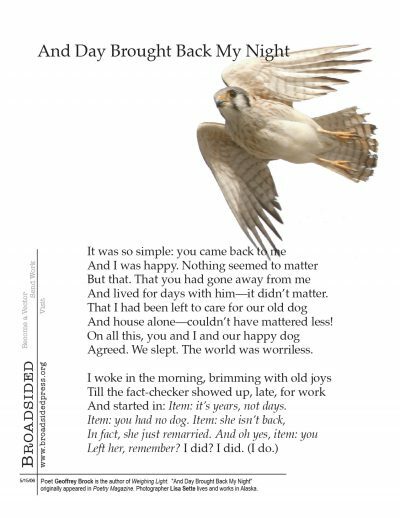 “And Day Brought Back My Night” originally appeared in Poetry Magazine. Artist Lisa Sette holds a BFA in photography and a master’s degree in biology.